International speakers from countries like Austria, Serbia, Netherlands, Romania, Poland, Belgium, Bulgaria and UK confirmed their presence to SHARE Belgrade 2019. 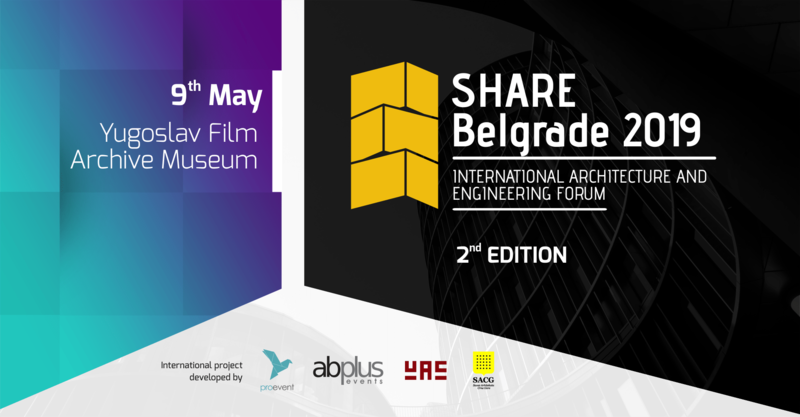 This edition of SHARE Belgrade 2019 will have 3 panels: Large Scale Projects, Architecture and Facades, and Special Guest lecture. Director and Architect studied architecture at the TU Braunschweig, ETH Zurich, and the Technical University Delft where he received his master’s degree in 1998. Previously Thorissen worked for MVRDV as project leader on projects including Unterföhring Park Village, the Frøsilos in Copenhagen, Buurt 9 in Amsterdam and the Market Hall in Rotterdam. Besides his work for MVRDV, he has acted as visiting critic at the Rotterdam Academy of Architecture, the ENSA Belleville, Paris, and the University of Applied Sciences in Leiden. “MVRDV is one of the most intriguing architectural practices globally: projects covering all imaginable scales, collaborating with the world’s brightest people, always pushing boundaries and exploring new possibilities,” he says. He was president of the Association of Belgrade Architects (since 1995) and the Union of Architects of Serbia, a member of the editorial board of the magazine “Architecture-Urbanism”. Is an architectural and urban design, of interior architecture and publishing business. His body of work includes over 80 projects, of which more than a third were realized. On the proposal of fellow previous winners of the highest honors the Union of Architects of Serbia, won the Grand Prize for Architecture in 1992. Year. It is also the holder of two of Belgrade (1975th and 1978), central government awards the daily “Borba” (1975), awards ULUPUDS (1993), as well as the Grand Prize (1975) and special recognition Salon of Architecture (1993). He was a founding member of the Initiative Committee of the Academy of Architecture of Serbia (1995). With an academic background in architecture, he focused his career on the parametric design of spatial structures. He was involved in several research programs at the University of Applied Arts in Vienna, such as “Algorithmic Generation of Complex Space Frames” and “Flexible Search in Parametric Design”. His activity at Bollinger + Grohmann involves collaboration with several architectural offices: Zaha Hadid Architects, for the Hungerburgbahn NEU in Innsbruck, Chalabi Architects, for the Sheik Zayed Desert Learning Center in Al Ain, with Dominique Perrault for the Vienna DC Towers, Lengfeld Willish, for the Skylink Airail Center in Frankfurt or for the Biennale Pavilion in Salzburg with SOMA Architects. The engineering practice Arne Hofmann is managing in Vienna focuses on creating innovative structures within an interdisciplinary planning team. The architect’s background aligns with the philosophy of B + G engineers, offering a bridge between architecture and structural engineering. 21 years of professional experience as a designer, associated partner and manager of Atelier Serafimov Architects. Member of UBA and CBA. Possessing a Master’s degree in architecture from the University of Architecture, Civil Engineering and Geodesy (UACEG), Sofia, 1997, Radomir successfully masters the complete design process and the logistics of the team. Starting as a designer at “ET Vanya Serafimova” in 2003, he then joins Atelier Serafimov Architects in 2003. A member of Union of Architects in Bulgaria (UAB) and a member of the Chamber of Architects in Bulgaria (CAB). Professor and Head of the Department of Architecture. He graduated from the University of Belgrade – Faculty of Architecture, where he worked since 1996. Academic domains and teaching objectives: architectural design skill development, creative thinking, and formulation of the concept in terms of the specific context. Dozens of professional awards for architectural projects, achievements, and competitions, both national and international. He contributed to the development of the spatial-programmatic study of sport and recreational complex Ski Dome, Berlin, Germany, and Resorts for 12000 inhabitants, Moscow region, Russian Federation. Prof. Lojanica in an awarded author of several completed projects and since 1998, he is a leading architect and founder of proASPEKT architectural studio. For nearly 20 years Michael has travelled the world working on a wide range of award-winning projects. In 2011 Michael he was selected by the Olympic Delivery Authority to be Learning Legacy Ambassador for Lighting. In 2012 Michael, named UK Lighting Designer of the Year.As well as a trusted voice within the lighting design profession, Michael co-founded the charitable Re:LIT initiative in 2013. He is a keen activist on educating and promoting all aspects relating to light. Michael is an active member of the International Association of Lighting Designers, Society of Light & Lighting and the Institute of Lighting Professionals. The studio was founded in Belgrade in April 2005. Founder and head of the studio, Zoran Abadic, M.Arch. It was founded as a result of a long-standing practice in the fields of architecture, urbanism and interior design. Studio is set up with the idea that through an innovative approach and work produces a harmonious and meaningful architecture worthy of existence. Organized as an architectural platform committed to research and promotion of real values in architecture. Active in the field of architectural designing, planning, interior decoration and design. Studio actively participates in public national and international architecture competitions. Jeroen Schipper studied architecture and urban planning at the Eindhoven University of Technology, graduating in 1990. His final project was nominated for the Archiprix (best National graduation project) in 1991. Following his studies, Jeroen worked for 3 years at Mecanoo Architects in Delft and in 1994 he was awarded a grant by the Foundation for Visual Arts, Design and Architecture in Amsterdam.In 2010 Jeroen founded Orange architects, together with Michiel Hofman (until 2016) and Patrick Meijers. Orange architects’ first realized project – the Cube in Beirut – was awarded in 2016 with the CTBUH award for best high rise in the Middle East and Africa region. Neoarhitekti was founded by Tatjana Stratimirović, Snežana Vesnić and Vladimir Milenković in 2000, as the core of the author’s group profiled to respond to the dispersed diversity of contemporary architectural practice: architectural and urban design, furniture design and interior design, graphic design, all spiced up with architectural theory. And they are studying the phenomenon of modernity in the practice of everyday life. Giuseppe Farris got his master’s in architecture at the Istituto Universitario di Architettura di Venezia (IUAV) in Venice, with professors like Aldo Rossi, Bernardo Secchi, and Manfredo Tafuri. In 2001 he moved to Belgium and in the year 2008 he founded Studio Farris Architects in Antwerp. He won, in 2010, the competition for the refurbishment of the counter hall of the Flemish Parliament in Brussels. With this project, Studio Farris Architects got his first international recognition. Not much later, also the Farmhouse in Lennik, The Park Tower in Antwerp, and The City Library in Bruges are internationally acknowledged. In 2013 Studio Farris Architects is selected for the redevelopment of the Zoo of Antwerp and for designing the headquarter of the Persgroep in Brussels.